Etegami are cards with simple images that you paint, along with some heart-felt words that echo the image and reflect your feelings. You usually mail the card to a friend or loved one. Usually very simple, just your first initial, but can also be something more creative, such as an animal or flower that you really like (see example below; in Japanese, “ant” is “ari,” which is a nickname for Alison). Click here for a sampler of etegami I have made or received. He was originally a traditional calligraphy student. He wanted something more spontaneous, personal, and accessible than traditional calligraphy. Etegami are spontaneous, and often done quite quickly. There is no sketching on your paper beforehand. Etegami are “living.” You’ll notice that the black lines are very wobbly, almost breathing. These are called “living lines” in Japanese and they are achieved by drawing the lines very, very, very slowly, and holding the brush in a unique way that causes the ink to be sort of wobbly. You’ll find that you can feel your heart beat and feel that sensation go into your brush. Higher bleed is more advanced as it’s more difficult to control the ink and watercolor. If you can’t get gansai – higher quality watercolors will work just fine! 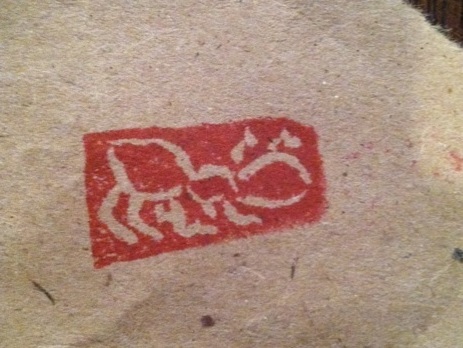 Stamp – can be made from an eraser. Hold the ink brush so as to purposely make it difficult to control. Why? To help you ignore the voices in your head that prompt you to paint well. Practice – Set aside some time at the beginning of any etegami session to practice your line. With higher-bleed paper, the paint will spread in amazing, unpredictable ways. Leave some white space – don’t fill in the blanks. Generally, use no more than three colors. Don’t worry about representing the colors exactly. Choose a subject, think about who you want to give the card to. Sign it with your stamp. Local communities – let me know if you’d like to be a part of a group in DC! Blick Art (aka Utrecht Art) and Plaza art stores sometimes have ink and gansai watercolor that are traditionally used. Paper, however, is harder to get in stores. I sometimes just use thin sumi paper (aka “rice paper” and glue it to regular postcards. Sometimes I just use regular postcards and give up the “bleed” found in traditional etegami paper. I have also tried to use some wood block paper you’ll find in art stores but they just don’t have the level of bleed that is crucial to etegami. DosankoDebbie’s Etsy Shop – carries supplies, in addition to her original art. Ships from Japan, so more expensive. Henry Li’s YouTube channel Blue Heron Arts has links short videos on etegami, as well as Chinese brush painting. The one where he paints a winter melon is a good start — he talks through the process and emphasizes that the point of etegami style is to emphasize the heart, not the skill, of the painter. One I particularly like though is his video on painting a durian fruit (jackfruit). In it he hits on the key point that what etegami artists do — they “summarize” the subject, they don’t aim to reflect everything. Moreover, you can practically smell the durian! That’s perhaps a good place to end my summary — I don’t aim to capture every tool out there that can help you learn etegami, just the important ones for me.